Synopsis: In the wake of the devastation caused by Superman’s battle with Zod in Man of Steel, Bruce Wayne seeks to take down Superman, fearing his powers could wipe out humanity. All the while, Lex Luthor is scheming in an attempt to wreak havoc on the world. Review: 2016 is certainly shaping up to be the year of the superhero movie, the Merc with a Mouth has come along, with apocalyptic doom for the X-Men, Marvel’s flagship heroes turning on each other, a group of anti heroes on suicide missions, and one sorcerer supreme still to come. Now, it’s the turn of arguably the two most recognisable comic book characters to take to the screen, in what is their very first time they are in the same movie. A movie that is finally propelling DC’s extended universe forward after watching Marvel dominate the market for many years. So much was riding on this film, and it was once again up to Zack Snyder to show DC’s universe can rival that of their great rivals. Two years after the carnage that was unleashed on Metropolis, a certain Bruce Wayne saw the full extent of the devastation and now sees this as the time to put on his cape and cowl once again and take out this alien threat. We see through his perspective and you feel his rage. All the while, while some of humanity view Superman as their saviour, others like Bruce Wayne, see him as a threat. One of these individuals being Lex Luthor who is developing a few schemes in order to bring down the Man of Steel. With a near two and a half hour run time, understandable given that this film is laying the foundations for the Justice League movies that are on the horizon, there is a lot to take in and a lot is going on. So much so in fact, that the first hour or so is a little choppy, you want to see the clash of the titans, but the road getting there is a little bit bumpy. As such a few of the side storylines could have been cut out, as there are some that don’t really add much of any value to the central story. Once we do finally get to the titular showdown, however, it is glorious, watching these two icons of comic books clash. This is of course until they have to unite to take on something (if you’ve seen the trailers, you’ll know what this something is.) Snyder clearly likes destroying things as there’s a fair bit of destruction here, although it’s not quite on the same level that Metropolis suffered. Yet while it is enjoyable to watch, like Man of Steel, there is something of an over reliance on CGI and there are some scenes (and characters) that just look painfully artificial, which is remarkable given the budget of the film at 250 million dollars. Although the accompanying score by Hans Zimmer and Junkie XL, is once again excellent. Taking up the mantle after Christian Bale’s terrific turn in the role, Ben Affleck certainly makes the role his own and gives a very strong performance both as Bruce Wayne and the Bat vigilante. Similarly, Jeremy Irons is also excellent as Alfred Pennyworth, which again was not exactly easy given Michael Caine’s tremendous work with the character. There is understandably a lot more screen time for Affleck as we have to get acquainted with him more than Kal-El. Furthermore, there is the matter of Wonder Woman. Although she is not in the limelight as much as her Justice League colleagues, Gal Gadot does a tremendous job in what is the character’s first big screen appearance, and more than holds her own, giving excitement for her solo movie out next year. However, while he does try his best, and does have his moments, Jesse Eisenberg does feel somewhat miscast as Luthor. Affleck and Gadot deliver terrific performances, and you have to praise the scope and ambition of the story, but it is a bit scrappy and could have been a little bit more focused. I’ve grown up loving the DC characters, it’s just a shame they aren’t getting the same diverse range of talent behind them, as Marvel seem to be getting. For the sake of longevity, I feel this needed to be better than OK. I think this needed to be great. Meanwhile, Civil War is getting all the praise heaped on it. 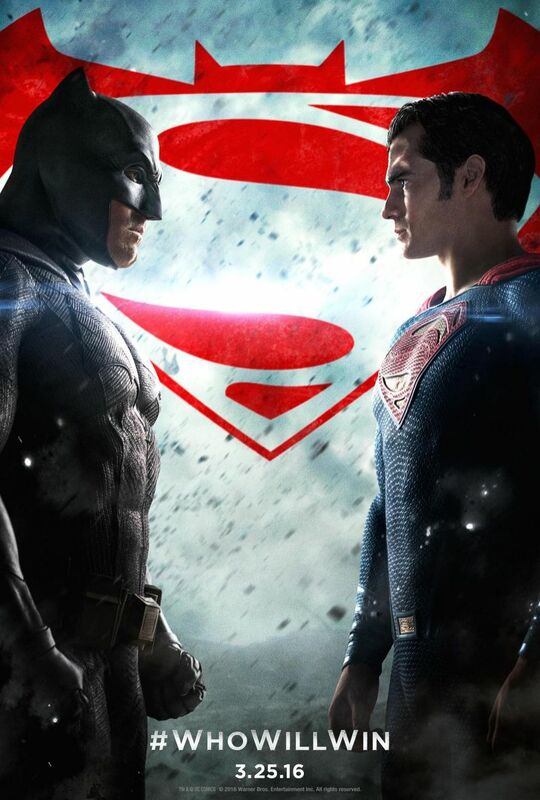 It looks like that movie will be the superhero main event of the year. Great review, by the way.